Thank you for your lastest Ezine message. 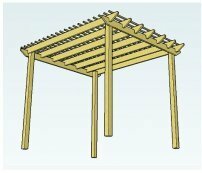 Here's the attached pergola lean-to I built after viewing your pergola plans and climbing plant information. I thought you might like to see some pictures of it now that it's finished. I live in Suffolk and the pergola has now matured with climbers and ornaments alike. You will note from the pics how it is growing. It does not show the climbers and resident solanum glasnevin being trained across the windmill end however. I also grew some 'Shirley' tomatoes in a tub under the attached pergola lean-to and was taking large tomatoes up to November. It reached the roof! All my friends and neighbours love it and have asked me to design and assist them in their own gardens. So thanks for the ideas! I loved building it as it stimulated my brain cells working out the hypotenuse etc. Pleased to say that my calculations were spot on! It's perfectly square. It had to be for the polycarbonate roof panels to fit. I have also added lighting since. My wife loves it! Thanks for sending the pictures over. 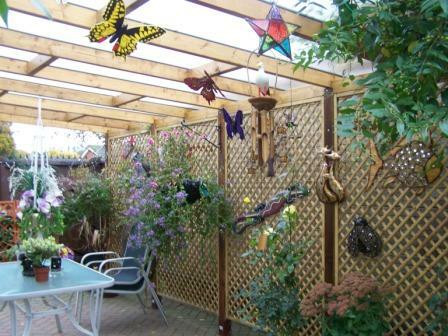 The pergola looks just fabulous! It really is lovely. I like the way you have used so many different ways of including plants and accessories to make your area an interesting place to sit. The darker colour of the posts adds to the overall effect, too. And, of course, it's weather-proof - what a bonus! It's no wonder your neighbours are keen to have you help them. Glad to hear that your wife loves it - a few brownie points never go amiss!! 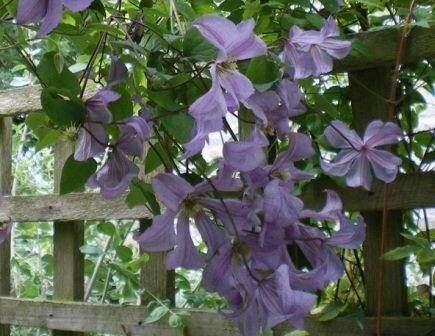 It would be great to see the climbers in flower. The solanum (top right of picture) is one of my favourites - such a beautiful purple. John mentions measuring the hypotenuse very carefully so that his polycarbonate panels fitted perfectly onto his attached pergola lean-to. 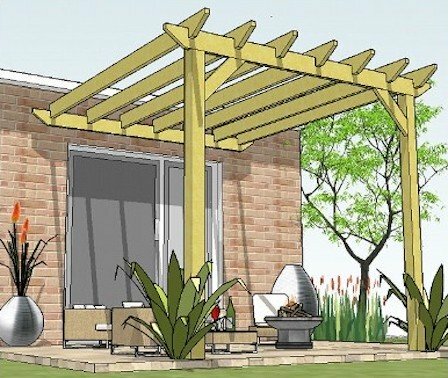 When building a DIY pergola, it is important that the distance between the diagonal posts is equal. 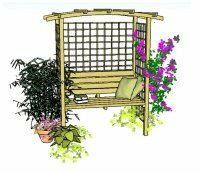 This ensures that the pergola is absolutely square. 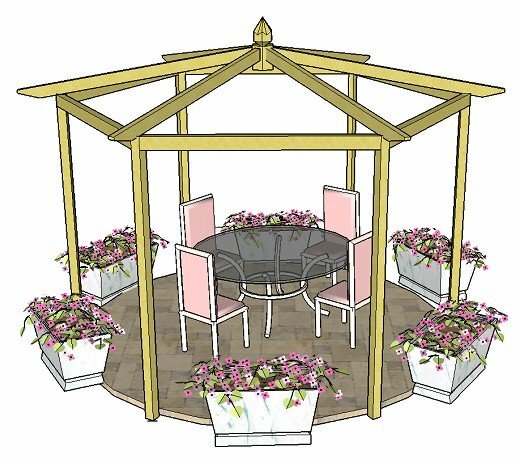 For example, say we had a pergola with the dimensions 8' x 12' - if we have opposite sides exactly the right measurement, it doesn't necessarily mean that the post footprint will be square. The angles need to be equal too! The purple diagonals in the top rectangle are perfectly equal, or 'square'. 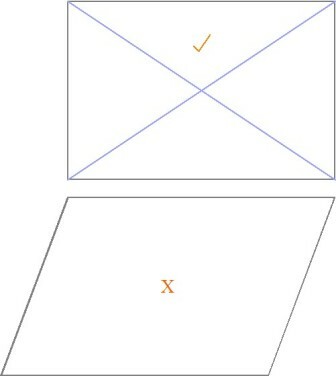 The bottom shape, even if it's just a tiny bit out, makes the rectangle become a parallelogram, because the diagonals are no longer equal and neither are the corner angles 90 degrees (I've exaggerated the amount it is off square to illustrate the point). You can adjust your post positions by using a retractable tape measure, moving them until the lengths are equal. The way that John did it, and for a very precise way of achieving equal diagonals and angles, is to calculate the hypotenuse. Sounds scary, but in actual fact it's not too difficult. Now this leaves us with a dilemma. What exactly is 14.42'! 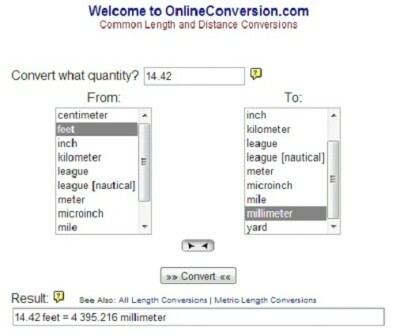 This is why, when doing more tricky calculations, I always use metric measurements. Here we find that 14.42' = 4,395.2mm. Point 2 of a mm isn't worth bothering with so we'll say 4,395mm, which also equals 4m and 395mm. This would be your measurement between the diagonal posts. I do use imperial measures for some things, but for this type of calculation it's safest to use metric measurements: you'll save yourself getting into a real muddle! It depends on how you visualise distance/length. Do you think in feet and inches, or in metres and millimetres? Even if you tend to think in feet and inches, if in doubt, use metric measurements. They are accurate, easier to calculate and you won't run into any sticky situations! Everyone loves climbing plants! They are something attractive to look at and smell while sitting under your attached pergola lean-to. The forms of different species and varieties are incredible, both planted on their own or in combination with other climbers. Like John, you can grow plants in the ground, in pots and in hanging baskets to give a really interesting and abundant look. "The plans were great, very concise and easy to follow and I couldn't have managed without them!"